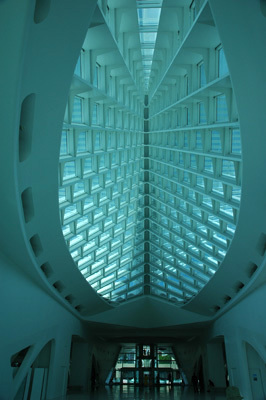 One of my favorite buildings in the States is in Milwaukee… yes.. I said Milwaukee. I thought my architect boyfriend was nuts on a recent trip to Chicago when he suggested that we rent a car and drive a couple hours to Milwaukee to see a building. I had visions of Laverne and Shirley singing in a brewery and couldn’t imagine what could be so inspiring that we would need to take this journey.. but I played along.. and was so glad I did. 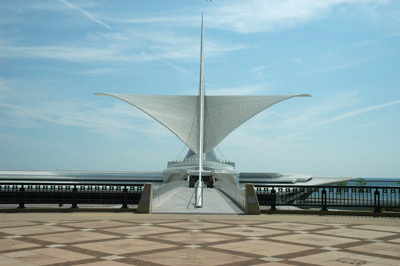 Spanish architect Santiago Calatrava completed the Quadracci Pavilion, an additon to the Milwaukee Museum of Art, in 2001. This was Calatrava’s first work in the U.S. Following this project he received the commission in to design the transportation hub at the World Trade Center site in 2004. Much of his early career was spent designing bridges and train stations, giving him a solid grounding in civil engineering, but Calatrava is also a talented painter and sculptor. The result is a blending of organic sculptural forms with technological innovation and engineering to create a very unique architectural style. 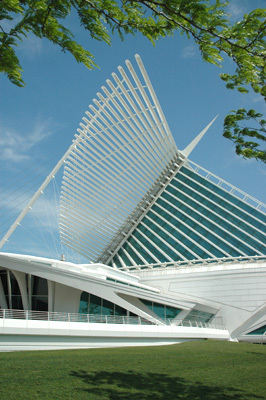 Calatrava’s addition to the Milwaukee Museum of Art is an excellent example of this ability and an amazing building to behold. It was designed to extend the Museum’s gallery space, create a new image for the Museum and to link Michigan Lake to downtown Milwaukee. The latter is accomplished by a 250 foot suspension bridge. The building is an extension of Eero Saarinen’s War Memorial built in 1957. Calatrava structure takes flight off Saarinen’s rather heavy concrete structure…. literally. The Pavilion takes the form of a skeletal prow of a ship (an appropriate reference to it’s waterfront location) and is dominated by a brise-soleil — two large wings or sails– which open and close. This kinetic sculpture is made up of 72 steel fins, weighs 90 tons, and spreads to 217 feet at its widest point. The Brise-soleil is not only beautiful but functional. It contains sensors which monitor wind speed and direction and temperature and light and adjusts the wings accordingly. It also gives a visual cue when the Museum is open to the public. It is both engineering marvel and delicate and sensual sculpture. The interior is pleasing as well. The grand entrance hall soars 90 feet and feels like the interior of a cathedral, bathed in light and pattern. The repeating organic shapes inside change as you move through the space. The quality of the detail is staggering. The museum itself is overshadowed by its structure. The collection is minor and the display in the older galleries very dark and unappealing. This visit is all about the building. All else pales in comparison. This iconic building is one that has stuck in my mind as combining those elements I find most compelling in contemporary architecture–exquisite structure, detail, sense of place, strength and elegance–AND IT MOVES!!! I have loved and enjoyed everyone of your entries – keep writing and I’ll keep checking!